PTV operates between 5:30am to 8:30pm on a 30-minute service to Mt Helen Campus. Travel time is 25 minutes from the campus to Ballarat city. All bus services arrive and depart from the Ballarat Railway Station and connect with other bus routes and V/Line services. 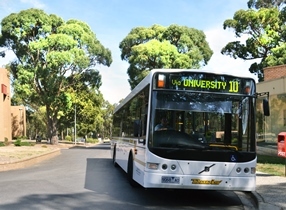 PTV operate two services to Mt Helen Campus, route 21 Buninyong and route 22, Federation University Australia via Sebastopol. 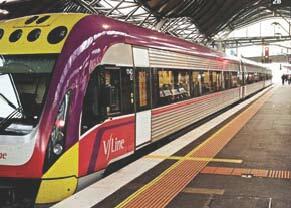 V/Line operate a rail service connecting Ballarat with Melbourne, Ararat and Maryborough. The Melbourne-to-Ballarat service departs from Southern Cross Station and stops at Melton, Bacchus Marsh, and Ballan. V/Line buses connect Ballarat with Geelong and other regional centres. Davis Bus connect with V/Line train and buses from the Ballarat Railway Station. We have undercover secure bike parking with storage for over 60 bikes plus 10 lockable cages. Bike storage is located under P building (near Unisports weights room) and is free for students and staff. Lockable cages are available on request. Cycling to Mt Helen Campus is safe and serene when you use the Canadian Creek Bike trail. The trail begins in Barkly St Ballarat (near the netball centre and skateboard park) and is a 10km sealed cycling/walking trail with direction signage to Mt Helen Campus. On arrival you'll have access to lockers, a puncture repair kit and a clothes line to dry cycling clothes. Showers are located upstairs in P building. 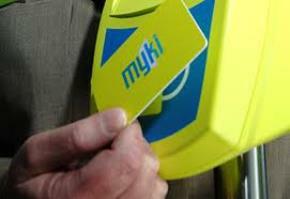 Current enrolled students and Mt Helen-based staff have been given access via their ID card. Entry is gained by swiping your card over the sensor. The sensor records who enters and exits the facility thereby making it quite secure. Users also need to abide by the terms and conditions located above the sensor. Contact the Sustainability Officer if your ID card does not open the gate. Mt Helen Campus is 10km from the Ballarat CBD and travel times are 15 minutes when traffic volume is low and up to 30 minutes in busy periods. It's best to avoid Geelong Rd in school peak times as the road attracts significant congestion. Buninyong/Sebastopol Rd and Yankee Flat Rd are alternatives to Geelong Rd in peak travel times. Car parking is also limited on the campus with only 1,300 free spaces and 350 permit spaces. The campus map (pdf 978kb) shows the location of the car parks.